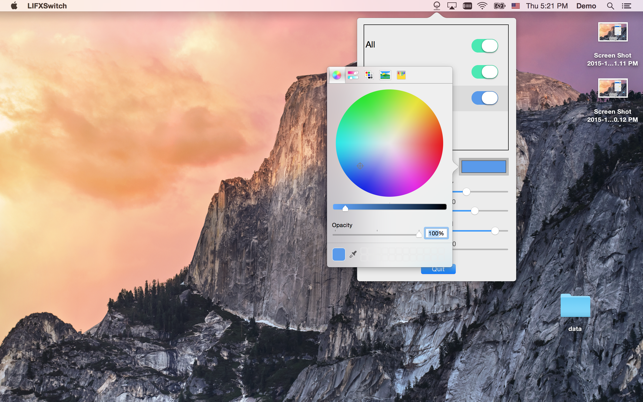 Control LIFX lightbulbs from your Mac in local network. With 'Switch for LIFX', you can turn On or Off any of your LIFX lightbulbs, set color for your lightbulbs. The App will automatically find all your LIFX devices in your local network. New version 1.1 support auto color change according to sound / music rhythm from your Mac microphone, and you can change the color for each musical note. * If you start the App first, then power on/off the lightbulbs, the App may need several seconds to detect that change. And if the lightbulb just power on, that may need several seconds to connect to your local WIFI, then the App can detect it. So it's better always use App to power on/off lightbulbs. * The App can only control lightbulbs in the same network with your Mac. Update for macOS Mojave 10.14. When I click on All Lights then adjust the kelvin slider, it switches back to the first lamp I have (Desk Lamp) and only adjusts the shade on that light. When I click on all lights and try the same thing happens. If I adjust only the color and any other setting it works on all lights, but when I adjust kelvin it only changes my Desk Lamp. Also, I wish the sliders would not be as precise as like in the Lifx app the Kelvin adjustments are in 500K increments. I really would prefer that as it is hard to dial in the right Degree when the slider is so precise. Finally, is there a way to add groups as I have the desk lamp and three lights that are in my ceiling fan that I would like to change all together but separately from the lamp. Besides those minor complaints this is a great app. I mostly only use it when I dont want to wake up my Alexa, or if I need to turn the lights off when watching a movie. Works great for those purposes. It is also nice having the preset colors from Apple and all of the colors in the crayon box are great colors. If they could tell me how to fix my issues, or fix them in an update, this app would be the perfect app for my Lifx lights. Thanks for writing this review and suggestion, we will improve this on future version, please send us email xuecsapp@gmail.com if you have other questions about the App. What a great controller for my bulb. Look in the second image at the 5 different buttons above the color wheel that represent other color selection menus. There are various sliders, color lists, a spectrum box, and a crayon box menu. It is better than I expected. Control the whites by setting the color to white and then going back to the main window and adjusting the Kelvin slider. I have no idea why Lifx itself hasn’t released a similar application. This is perfect for local use — that is, on the Wifi network where the bulbs are installed. Unfortunately, it doesn’t work when you are not on the same Wifi network as the bulbs. It can’t discover remote bulbs.